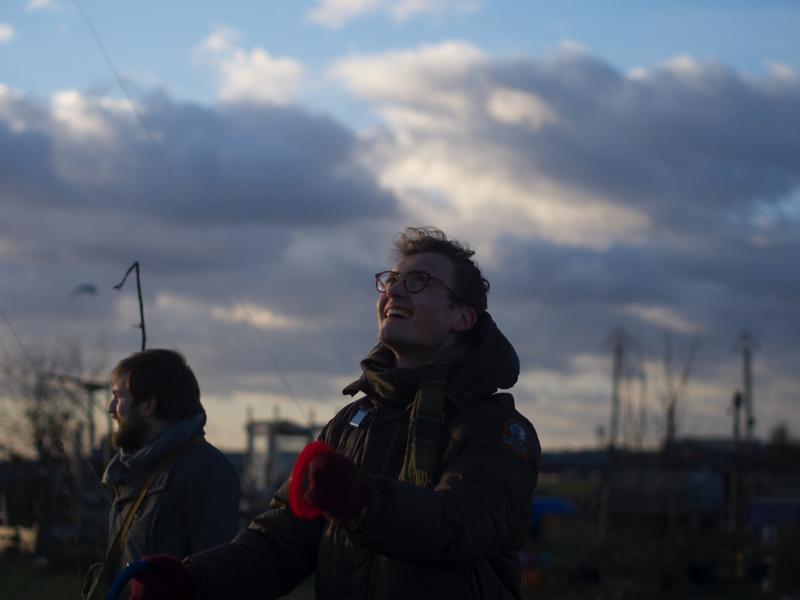 This post is my summary of an experiment I started in January 2015: Learn German in 30 days. “I learned German” means I can have basic conversations in German, as well as understand German fairly well (both written and spoken). I have definitely not learned how to speak German perfectly. I do not claim originality of everything in this text; I’ve been heavily inspired by the writings of other language learners such as Barry Farber and Benny Lewis. My native language is Norwegian. This gave me somewhat of an advantage as it is linguistically closely related to German. If you want to learn a language as quickly as possible, you should keep reading. In addition to giving some general tips, and hopefully inspiration, I’ve created some resources that I’ll share in this text which will help you learn German fast. I spent about 30–60 minutes daily in my 30-day period, so the time investment wasn’t huge. Below I’ll explain exactly how I used these principles to learn German. 1 and 2 are nice because they’re measurable, but the most important key result to me was number 3, which was a bit too vague. In order to make it more tangible, I booked a ticket to Berlin, and decided I should be able to spend the whole weekend with an old (German) friend, speaking only German. I believe one of the biggest mistakes you can make when learning a language is to postpone speaking until “you’re ready”. Language learning is like going to the gym: if you want to build muscles, anything other than exercising is just procrastinating. Specifically what I did to speak from day 1 was to find some friends who either spoke German, or wanted to learn German. I then told them that I would be online for 30 minutes on appear.inevery day at 8pm and gave them my own custom URL. I told them I would love to practice German with them there. I managed to get 5 people to join in total. None of them were native German speakers, though some were already fluent (which I found to be critically important! ), and some were just starting out like me. In order to be able to stay in our target language (… German), and not revert back to English or Norwegian, I created a Cheat Sheet containing essential phrases. This sheet prevented me from getting blocked and generally proved incredibly useful in our online conversations. Following the “language is a muscle” analogy, I also repeated out loud anything I heard or read in German when studying on my own. Compared to only passively “receiving” (listening, reading) German, I think this really makes a difference for strengthening those German synapses in your brain. 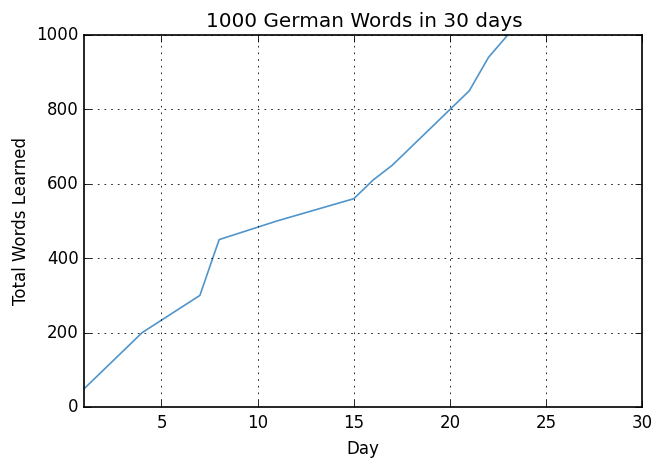 If you’re not familiar with Zipf’s law, you might be surprised to hear that only the 100 most frequent words account for about 50% of all spoken words in German films. Take a moment to reflect on this astonishing fact. This basically means that every other word you hear in a German film is a word from that top-100 list. The obvious conclusion? You need to know those words! 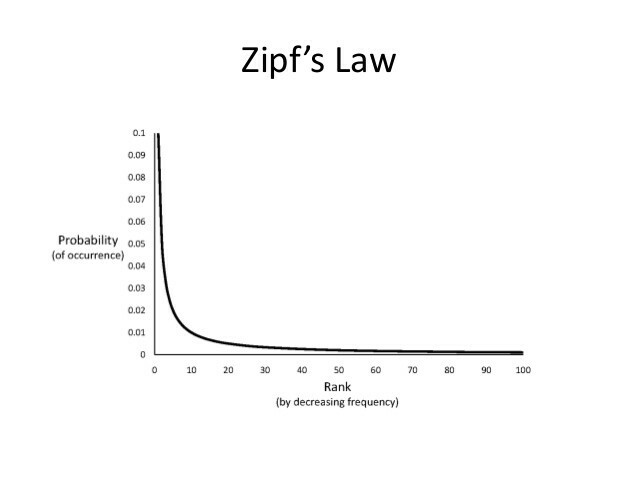 Illustration of Zipf’s laws borrowed from this presentation. I found a list of the most frequent words in German subtitles here, and created my own GoogleDocs spreadsheet with the 1000 most frequent words. These words account for ~75% of all words in German subtitles. My simple task then was to fill out the “meaning” column for every word before my 30 days had passed. In other words, I had to learn about 30 words per day. I made heavy use of cognates from English and Norwegian in order to learn them, and I exported the words I had learned to Anki about once a week so I could make sure I didn’t forget them. The frequency list is one of the things I did that worked best. It served as a nice anchor that I could centre my learning around. To test my vocabulary in the real world, I sometimes tried reading German newspapers or books, highlighting words I didn’t understand. After reading a page or paragraph, I would count the words I knew vs words I didn’t knew, then compute the ratio words known / total words in text. Towards the end of my study period, I would clock in at around 80–85% — cognates or context helping me push above the 75% I got from the top-1000 list. Changed my Facebook language to German. Watched lots of Yabla videos. 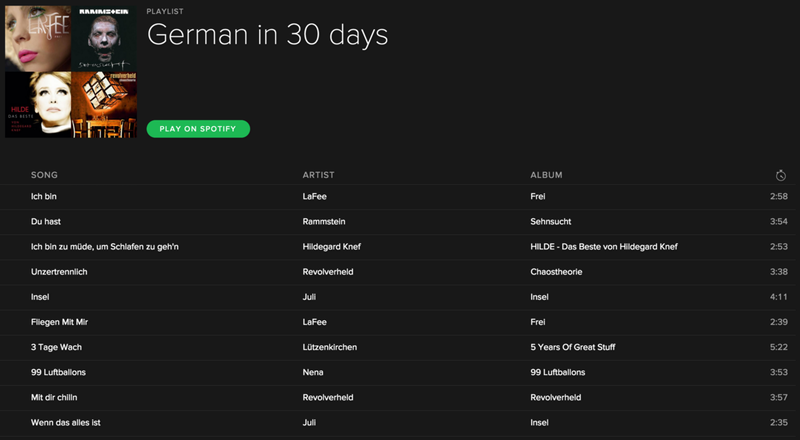 But the thing that worked best for me was my Spotify playlist with 10 German songs. Once I had learned the lyrics of these songs, I could play them whenever and be exposed to German anytime I could listen to music. I even recorded myself singing and playing these songs on the guitar. Again I’ll spare you the embarrassment. Picking the lyrics up from just listening to the songs is hard, so I would study the lyrics separately before trying to memorize anything. I used Lingq, which meant I had the lyrics available on my iPhone, and I could easily track which words were new when studying a new song. My Top 1000 Words spreadsheet was great for knowing roughly how many words I knew at any given point. Since I had the frequency of each word, I could compute the total “mass” of German that I knew — not just the total number of words — which I found to be quite motivating. I also kept a simple diary in Evernote listing my activities per day. In the end there was only one day when I didn’t do anything at all. I followed a course called RocketLanguages, but I only completed the first 3 modules. On day 27, I started Duolingo and managed to test in at level 10. Not bad! I almost didn’t do any grammar study, which I think was a good decision since I only had 30 days, and had no ambitions of speaking perfectly. One thing I would have liked to do in order to learn the German cases, though, is a set of 4 sentences of the type “The man gave the book to the boy” — one sentence for each gender + plural. Memorizing these four sentences would then probably have been a lot easier than trying to remember a case table. Having concluded the experiment I would say I reached my goal. I learned the 1000 most frequent words (and probably some more that I didn’t track). 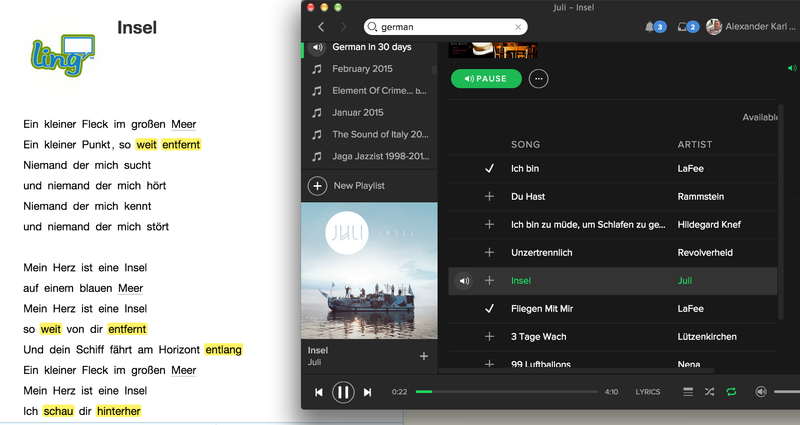 I learned 10 German songs by heart. That’s it! Either this gave you some inspiration to start your own 30-day language adventure or you think I’m insane. In any case, let me know what you think of my experiment!